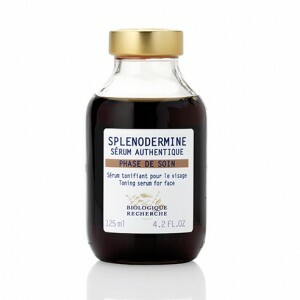 Sérum Splénodermine is an intensive concoction to regenerate and firm the skin’s supportive tissues. This advanced formula enriched with cellular oligopeptides of spleen extract will redefine the facial outline and is highly recommended for anyone experiencing loss of tone. Intensely firming and unifying, this serum will leave your skin looking younger and radiant. It could also be used mixed with your favourite body cream to tone and firm contours of the body. Dull, devitalised and sensitive Skin Instants®. Toning and lifting agent: Cellular Oligopeptide.